THE BIBLE: Why should we believe as Jesus did that it is 'the mouth of God'? When did it come into existence? Is it inerrant? What do we need to learn in order to understand it better? How does its teaching change our lives? In From the Mouth of God, Sinclair B Ferguson answers these and other important questions about trusting, reading, and applying the Bible. 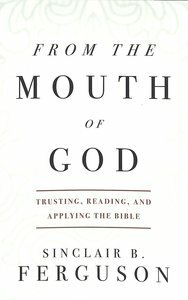 About "From the Mouth of God: Trusting, Reading, and Applying the Bible"